I recently joined the Samhain celebrations at the Hill of Ward and, as such things often do, it provided insight and examples and brought my thinking on a lot of matters religious into perspective. Inn this post I’m going to be discussing comparative religion dispassionately – I don’t know what’s true (I can say things that aren’t true and things I really hope aren’t but don’t know what is) – truth barely matters for this purpose. Liberal Christianity is currently haemorrhaging people, Conservative Christianity is attracting some but driving many more away. And Atheism doesn’t answer the non-theological questions religion does (something commonly missed – although Humanism sometimes tries). So what does religion offer (other than the attempt to “eff the ineffable”)? I see seven separate aspects, with some being more important to some people than others. Vision, however, is one of the most important. And it’s vision that matters here – vision is the part that normally gets people in through the door. Conservative Christianity provides a vision. And it’s a vision of a great struggle; something people find inherently compelling. It’s also homophobic. Which simply puts people off. Countercultural elements such as creationism don’t just drive people away, they make it look ridiculous. But unlike Liberal Christianity, Conservative Christianity has something to offer. Few are prepared to die for the Unitarian Jihad. For that matter, few are prepared to get up on a Sunday morning for it; they might get up for the social club, but the vision appears to be one in which they stand as a buffer between conservative homophobia and mainstream charity and acceptance. “We’re trying to make our bad co-religionists less evil.” That’s not going to attract anyone – and the social club isn’t one that does things. 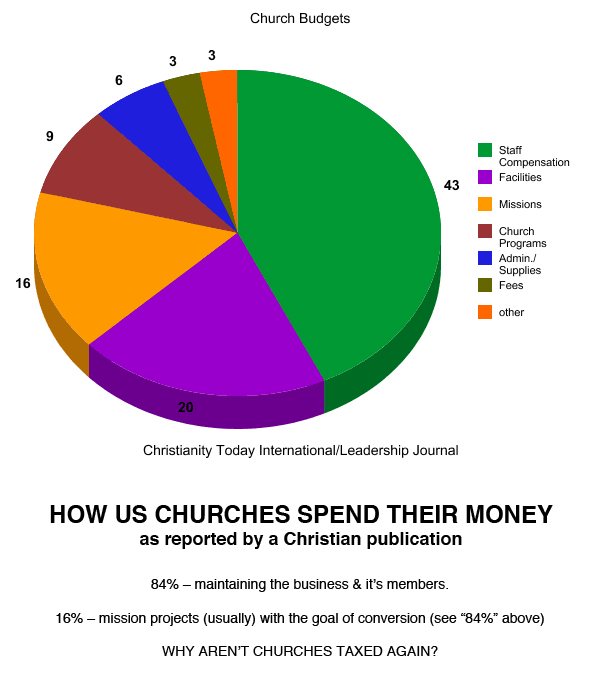 (Not even charity; take out giving to churches and Christianity correlates inversely with charity, and any actual charity provided by churches is significantly less than 12% of their spending). In earlier eras Liberal Christianity had a vision of improving the world – whether it was Abolition, Prohibition, or even Christian Socialism or Liberation Theology. But right now, although it’s embedded in movements such as Occupy (the first time I went to Occupy London I found what was effectively a Quaker Meeting for Worship on the steps), the vision it presents is as much of being Post-Evangelical as anything else. And in a time where we can legitimately ask why the poor shall always be with us, the vision it offers is not terribly engaging except as something parasitic on Conservative Christianity; the current purpose of the liberal church appears to be to give conservative Christians somewhere to go so they can give up the actively malign parts of their faith without giving it all up in one go. And yes, I know I’m generalising madly – and there are liberal Churches that do a lot of good and have a vision. But those tend to be very localised. Without the broad brush you’ll never get anything done. This entry was posted in Misc Advice, Religion and Atheism by Francis. Bookmark the permalink.